Tonight is a special meeting of the DeKalb city council. Unlike all other council meetings, this meeting will not be recorded on video. That’s because the city does not know how to video-record meetings outside of council chambers, and council is not meeting in chambers tonight, even though this is the only city meeting scheduled. Instead, they’re holding it in the Bilder room at DeKalb Public Library. I understand that the Bilder room holds about 30 people. If true, it’s a potential problem, because it’s a committee of the whole meeting, where the number of participating city staff will likely outnumber the council members, and leave — maybe — seating for only about 15 members of the general public. If more people show up than the room can reasonably hold, that’s an Open Meetings Act violation. The venue makes no sense. On January 24, 2018, the City Council will hold a Goal Setting Session to determine what goals they want to accomplish in 2018. As part of that session, the Council would be asked to identify short-term and long-term goals. Specifically, goals or projects they would like to address in the next one to two years would be identified. This would determine what subject areas Council wants staff to focus their time on and could impact the current and future budgets. Council will be asked to identify the broad outcomes to be accomplished in the next 18 months to three-and-a-half years. But that’s not all. I’ve attended several planning sessions over the four years of city manager Anne Marie Gaura’s tenure. She is incapable of hiding her hostility toward us. They place the tables in an enclosed rectangle so the audience is facing people’s backs, and between this unfortunate positioning and their failure to use microphones, what you hear is dependent on the projection skills of each individual. Meanwhile, the audience has to wait an average of four hours for a chance to speak to its representatives, after all the decisions have been made. It’s sketchy. Unacceptable. A 100% shut-out in every meaningful way. Which is exactly why you should attend if you can. Sometime during the six-hour-long regular city council meeting last Monday, the mayor asserted that the city attorney works for the city council. This is incorrect information, and the real story must be understood NOW to help people understand why the city might have just placed potential litigation with the county on the table. 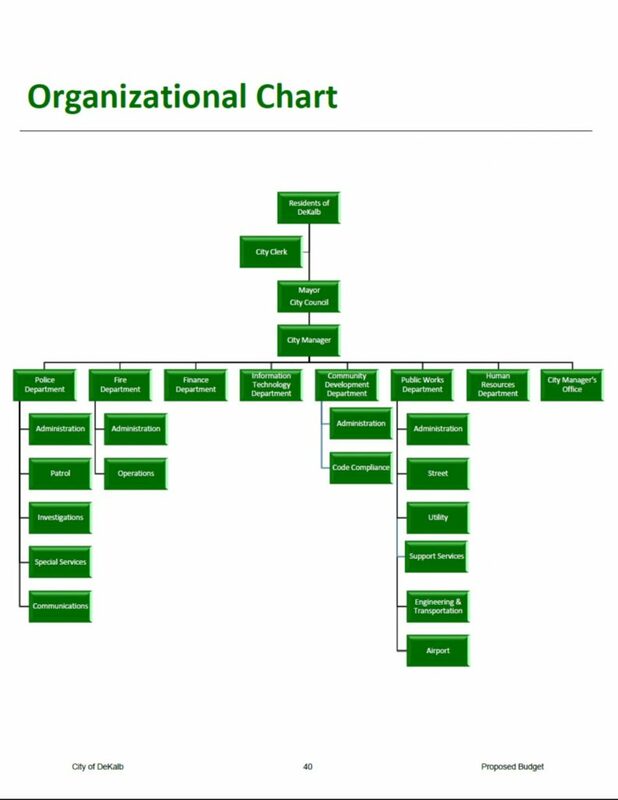 Exhibit A: DeKalb’s organizational chart (from the proposed fiscal 2018 budget). Anne Marie Gaura’s employment agreement with City of DeKalb expires at the end of 2017. That is, it expires unless a resolution presented as a contract “amendment” gets passed by city council on Monday. They’ve placed the item as a resolution to amend the employment agreement on Monday’s council meeting agenda. But it is not just an amendment to DeKalb’s contract with Anne Marie Gaura. It is a renewal, because the amendment removes the expiration date from the contract. Appointment and Removal. The City Manager shall be appointed by the Mayor and Council voting jointly. The City Manager shall serve and hold office for a term of office specified by virtue of an employment agreement. If you believe the people of DeKalb deserve an up-or-down vote on a contract renewal that includes the legally mandated term of office, please share your views with council members. There’s another special city council meeting, specifically a budget meeting, set for this evening. It’s apparently a follow-up of what they discussed last week. On Thursday, the council held a joint meeting with the finance advisory committee to outline a proposed 5 percent reduction in city department budgets for fiscal 2018. This equates to nine full-time positions and 11 part-time positions being dropped and nearly $20 million being cut. That’s not a typo in the headline. There are, I believe, two proposals for a sales tax hike of one cent for fiscal 2018. One comes from DeKalb city administrators, the other from the city’s finance advisory committee (FAC). DeKalb’s police chief, Eugene Lowery, is so very, very tired of your negativity. Here’s what he said at Monday’s Committee of the Whole meeting of council. I want you to hear everyone’s voice. Not the voices of the few that walk up to this podium, and day in and day out, or week in and week out, have nothing but negative things to say. In this setting (or so my 12 years of watchdogging the city tell me) “negativity” is substituted for the more accurate word “disagreement.” It’s a device the bureaucrats occasionally use to try to silence and marginalize people who disagree with their ideas, goals and methods. But I don’t believe I’ve ever heard a city employee straight-up tell the city council who to listen to. That part may be unprecedented. During a special meeting of the city council yesterday, I alleged that City of DeKalb had not given sufficient notice of the meeting, in that DeKalb did not explicitly name a location for it. The city maintains that it gave sufficient notice because the agenda was printed on city letterhead, which includes the address of the Municipal Building. I believe letterhead may be sufficient for a regular meeting but not for a special meeting. From merely a practical standpoint, consider that DeKalb often holds special meetings in special places, not just the Muni Building. As an example, I’ve attended special meetings of council at NIU, the library — even once on a bus. People who attend city meetings know about this aspect of special meetings, and the lack of location information caused confusion among the public yesterday.